Our phones have our whole life stored in them, from our favorite song to our favorite memory, our phones have everything stored but if we listen to music on our phones, our phone’s battery will die really quickly, this is why more people tend to use iPod’s. Many people think that they have to buy the albums or download the songs again, but that is not true. You can export your playlist from your iPhone and import it to other devices if you want. This way you get to have your favorite songs on two different devices and you don’t have to use your phone too much. This saves your phone’s battery while you still enjoy your songs. Exporting songs from your iPhone is not that difficult, it is pretty easy as we are going to explain it to you. Many articles tend to use words that only technologically advanced person would know but same is not the case with this article. We are going to use layman terms so that you can easily follow our steps. Part 1: How to Export Playlist from iPhone to iTunes Using 3-Party Tool? 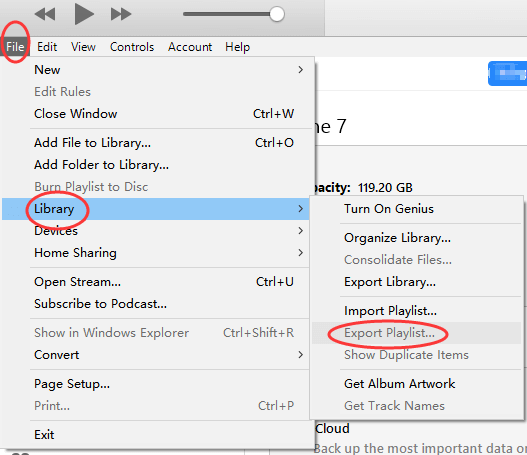 Part 2: How to Export Playlist to iTunes from iPhone via iTunes? Part 3: How to Export Playlist from iPhone to Computer for Backup? How to Export Playlist from iPhone to iTunes Using 3-Party Tool? Exporting your playlist from iPhone is pretty easy and you won’t have to worry about getting lost. We will guide you and give you a detailed step by step guide. It takes hours upon hardworking hours to create a playlist that touches your soul and more than often it contains albums upon albums of songs. Sometimes you want to listen to songs on your iTunes while you are doing your homework but you cannot waste hours creating a new playlist. iMyFone TunesMate can deal with your issue. 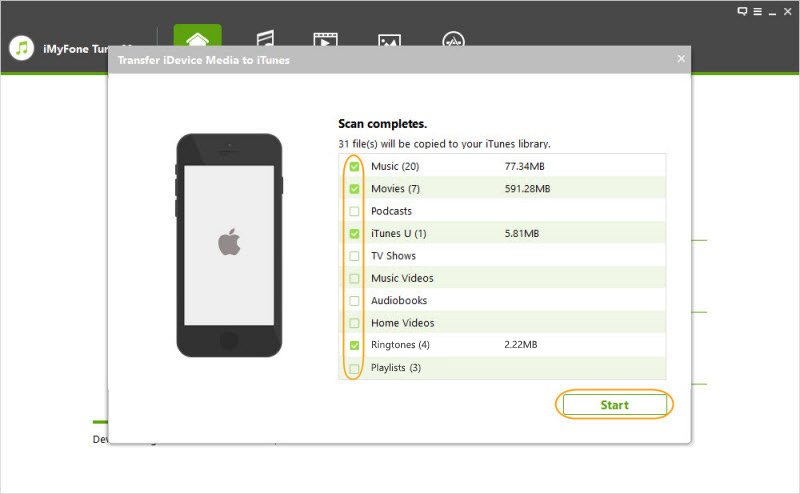 It can easily export playlist from iPhone to iTunes. 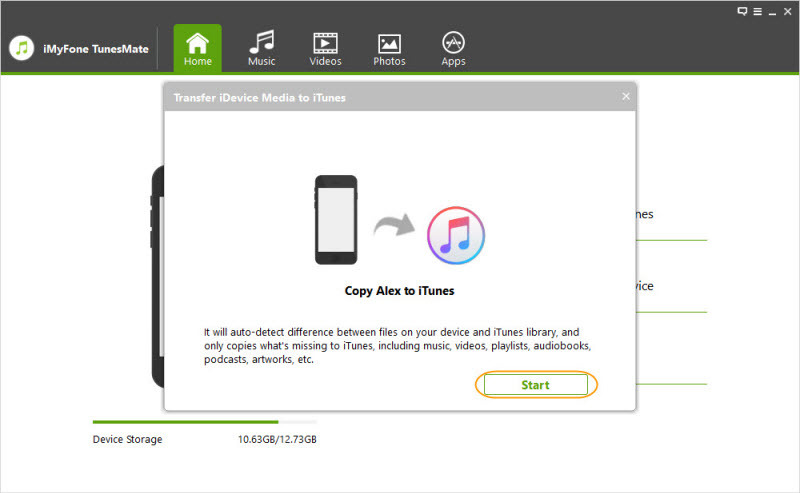 Transferring files between iPhone and computer includes iTunes purchased files or free-downloaded files. Step 1. Download iMyFone TunesMate on your computer and after downloading and launching it. Step 2. You can then connect your iPhone to iMyFone TunesMate without even opening iTunes. Step 3. 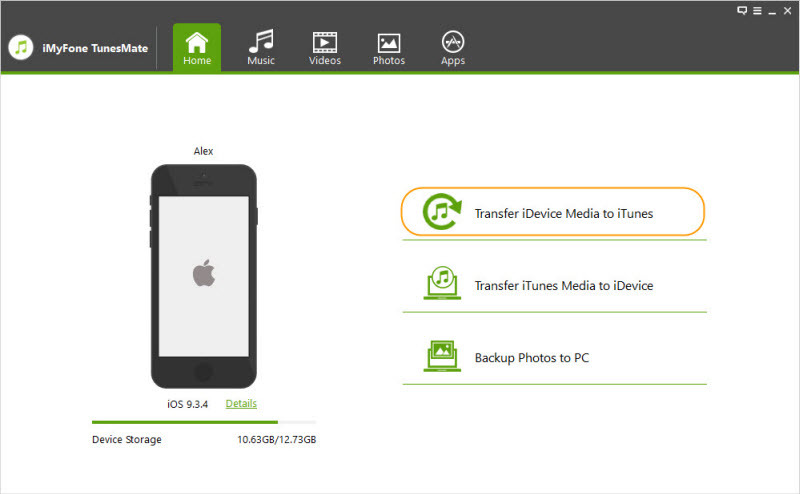 Choose “Transfer iDevice Media to iTunes” mode on the main interface. Step 4. Click “Start” button from the pop-up window to continue. It will scan all the media files on your device. Step 5. Then you can check playlists only according to your case. Then click "Start" button to begin the transfer process. Step 6. Click "Complete" button from the pop-up window of "completes" to finish it. Your music is now exported and you did not even have to do much work. There are many advantages to using iMyFone TunesMate. 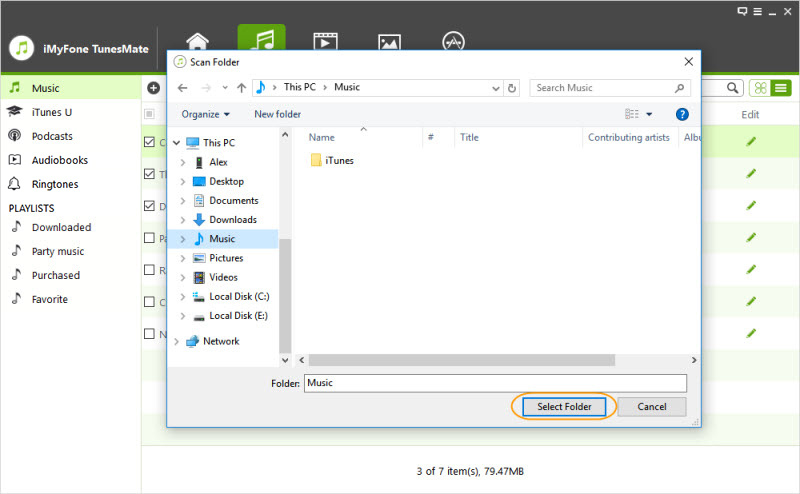 You can easily transfer your music which is a two-way connection. You don’t even need to input your password. 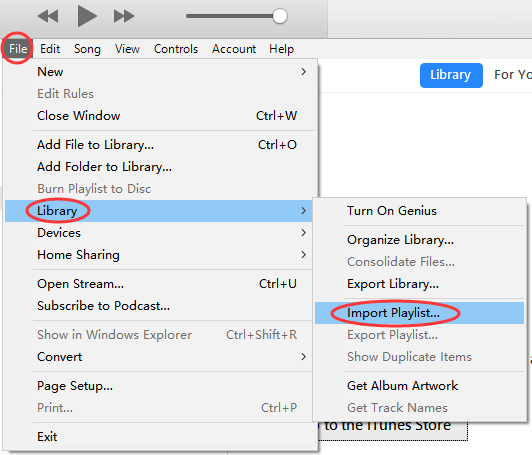 How to Export Playlist to iTunes from iPhone via iTunes? One thing you must make sure while exporting to iTunes is that the songs in your playlist must exist in your iTunes library too. You must make sure that your version of iTunes is updated. Step 2. Connect your phone to your computer via a USB cable and then connect your phone to iTunes. On the top of iTunes, click your iPhone icon. Step 3. 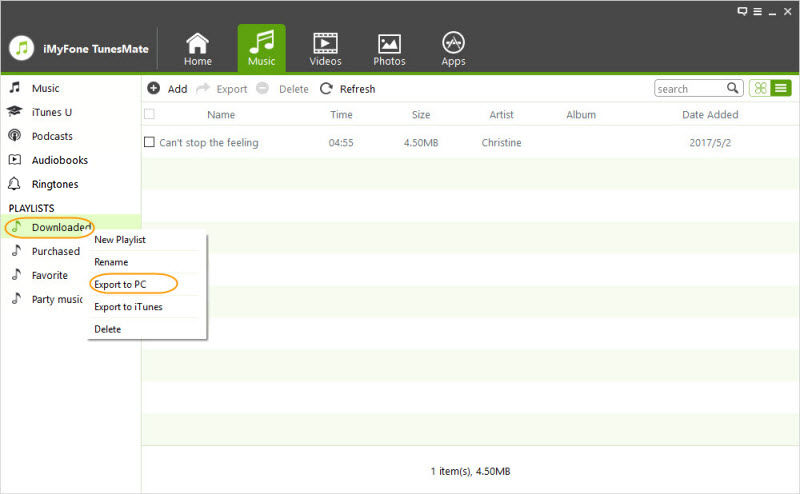 After then, click “Music”, choose the playlist you want to export and then open “File > library”. Many options will become visible to you. Click on “Export Playlist” and save the playlist. Step 4. On iTunes, go back to the iTunes menu bar. Open “File >library” and then an option of “Import Playlist” will be visible. Find the playlist that you just exported and then add it to iTunes. You have successfully exported playlist from iPhone to your iTunes. How to Export Playlist from iPhone to Computer for Backup? Step 1. Install TunesMate on your computer. Step 2. Connect your iPhone to the computer via USB cable. Step 3. When your iPhone is recognized. You can click on “Music” on the top. Step 4. Then you can see your playlists are listed on the left menu bar. Step 5. Right click on the the playlist you want to export, you can see a pop up menu, just choose “Export to PC”. Step 6. Then, you just need to choose a place on your computer to save the playlist. See, it’s so simple to backup your iPhone playlist or music to computer. Feel free to download it and have try. We hope this article proved helpful for you. If you have any more questions regarding this please do comment below.